Perfect for large offices or just to compartmentalize a smaller office, panel systems from ROF Furniture come in many shapes and sizes. Plus, we offer new, used, and refurbished configurations of our panel systems to accommodate for any budget and need. Our panel systems are made to the highest standards for quality and craftsmanship, ensuring that they will be beautiful for years to come. Whether you’re designing and decorating a new office or you need to add to an existing design, panel systems, partitions and cubicles from ROF Furniture can help. Because we do our refurbishing in-house, we can offer more paint colors and fabrics than other remanufacturers, allowing you to customize your panel systems to fit your desires. Plus, because we use environmentally friendly and efficient techniques, such as powder coating, the cost of our panel systems and office cubicles for sale is extremely low. To get the best of both worlds with your panel systems and other furnishings, contact ROF today. 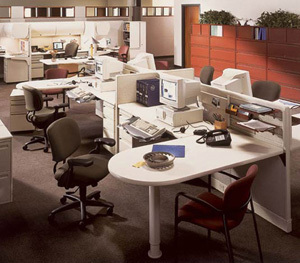 We’ll help you choose from our large inventory of office furniture for sale, including desks, file cabinets, and other office furniture system pieces, and comfortable office chairs, like Herman Miller Setu and Steelcase Amia.